German-born, American-based artist Uta Barth (b.1958) is among the key recent figures who have brought photography to the prominent position once occupied by painting. Her photographs of interior and exterior, urban and natural environments capture fleeting moments as if glimpsed out of the corner of one's eye, where we become aware of the beauty of everyday light, space, texture and luminous surfaces. Working in broad series, each body of work explores different details of our surroundings, such as the corner of a room (Ground #38, 1994), the headlights of a passing car (Field #3, 1995), bare trees seen through a window (white blind [bright red], 2002). A kind of 'portrait photography, but with the sitter removed', Barth's work focuses not on the subject of the photograph, but on the subtle play of light and shade on planes and surfaces: that is, the phenomena of vision itself. Often one element, such as a few leaves on a branch, is brought into focus while all else is dissolved and diffused, suggesting the atmospheric work of painters of the past, from Vermeer to Turner, or suggesting the background ambience of film. 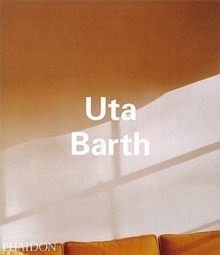 Barth's work has been exhibited at museums around the world, including the Museum of Modern Art, New York; Tate Modern, London; and the Solomon R.
Guggenheim Museum, New York. In her Survey, Pamela M. Lee examines all the key series that have marked the artist's work, among them Ground (1994-7), Field (1995-6), nowhere near (1999), ... and of time (2000) and white blind (bright red) (2002). In the Interview curator Matthew Higgs discusses the artist's earliest introduction to photography and her work's possible misinterpretations as 'sentimental' or 'painterly'. Artist and critic Jeremy Gilbert-Rolfe focuses on the three-panel work Untitled 98.5 (1998), a turning point in her oeuvre. For her Artist's Choice Barth has selected extracts from Joan Didion's novel Democracy (1984) that reflect the visual nuances of her own work. Artist's Writings include a new text by the artist that mirrors her unique observations on vision, perception and photography.